Feel the difference of the best creative and elegantly crafted Cross Pendant Necklaces by Bethlehem Christian artisans available at HolyLand-Gifts.com. It is the destination where your search for something unique and exceptional comes to an end. With a wide and exclusive assortment of Necklace with Cross Pendant, we give you versatile and stylish necklaces that not only make you feel close to your religion but also make you look distinguished. 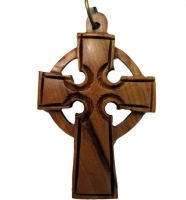 Here, you’ll find a wonderful selection of wooden crosses necklaces and Necklace with Cross Pendants made of natural olive wood and beautiful mother of pearl. Whether you are interesting in having a dignified, stately and stylish necklace with cross for men, women or people of all sizes and types, we have plenty of choices that suit all occasions. All of our holy supplies are not expensive. They suit all pockets as they are affordable and are sold on a reasonable price. More interestingly, our unique collection carries the fragrance and beauty of Bethlehem, where Lord Jesus was born. This is only necklace with cross pendant store, that I know of, around the area. they have everything you would need for your religious needs.